Whelpppp. Summer 2015 is officially over (though I'm not packing up my flip flops just yet...). It's the first day of Fall 2015 and to say I'm a little sad would be an understatement. I miss Summer already, though if we're being honest its felt like Fall around here since the end of August. I have a love/hate relationship with Fall y'all. I love the colours of fall, wearing scarves and boots, HALLOWEEN, eating yummy soups - all the quintessential fall things. But I hate saying goodbye to Summer more than anything. I think I would love Fall more if it actually lasted until December 22nd. However, Winter always pulls a nasty prank on us and usually shows up at least 6 weeks early. There were plenty of times throughout my childhood that the snow was already on the ground at Halloween. I'll embrace these first few weeks of Fall though, until the leaves completely fall off of the trees and the temperatures dip into the negatives. Then its unoffically Winter in these parts and I start counting down the days until Spring. But for now Fall is here and I have lots of Fall related things I need to get done before the snow hits. Thats my backyard y'all. As much as I crave big city life it sure would be hard to leave this view behind! I haven't been to the pumpkin patch since Graycie was a little baby and she just turned 5 so its definitely time for a trip back! Hocus Pocus, The Nightmare Before Christmas, Practical Magic, Casper, Double, Double Toil and Trouble, etc. Don't know what 'Boo'ing is? Check out an example here. I'm so excited for this! It combines two of my favourite things - drinking and Hocus Pocus - so its a win-win! 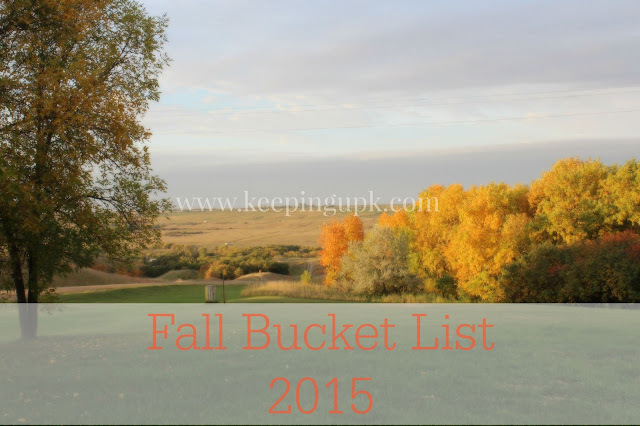 What's on YOUR Fall Bucket List? Let me know in the comments! I 100% agree with you about fall. I hate saying goodbye to summer because it means cold winter is right around the corner and I hate being cold. i want to live in flip flops and tank tops all year long. I do enjoy the three weeks of fall weather we get though, for all the many reasons you blogged. I love cook crisp evenings with hot cocoa and snuggling up in a warm blanket. I need to do a freezer stock day, we've never done one [very little freezer space] but I still want to stock some soups. I also need to get back to whole30, I might do a whole20 or something because we have a LOT of things this fall. Good luck with yours. YES! Hocus Pocus and Nightmare Before Christmas are amazing. And ummm thank you from the bottom of my heart for the Hocus Pocus drinking game! I'm definitely going to be completing that. I am craving soup like crazy and Michael and I have been drinking hot chocolate every single night lately. Is Practical Magic considered a Halloween movie? Haha I love that movie but I've never thought of it that way! I've been ready to watch Hocus Pocus since I saw the first leaves start changing around here. I can't believe this year has flown by so quickly! But I'm ready for boots and scarves and fall food, I just hope it lasts long enough before winter sets in here too! I am right there with you on always having a hard time letting summer go! It's not the same for us people up north that have to deal with real winters (especially you!) following fall! And a Hocus Pocus drinking game? Count me in for that ;) Thanks for linking up! 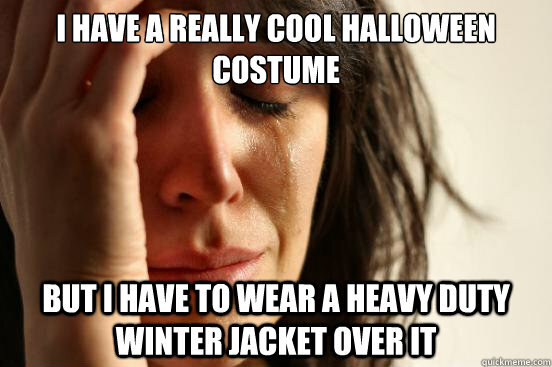 Hahhaha that fall meme about costumes is TOO TRUE! Growing up in Chicago, I felt like every costume was ruined by the clothing I was forced to wear under it. Now that I like in Atlanta, its so nice to be able to go out on halloween without a coat. did you know practical magic was a book first? i just found that out and can't wait to read it because i LOVE the movie (all year round lol). i totally want to play the hocus pocus drinking game. and for real, i feel you. i hate saying goodbye to summer and i hate that winter is on the way. i honestly don't know about uggs vs hunters. i reeeeaaaallly want some hunters but holy $$$. i also wouldn't mind some uggs. life is hard. haha. 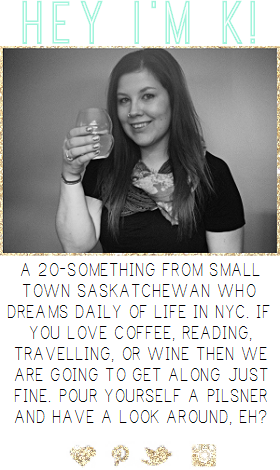 I posted my fall bucket list this morning actually. Complete with a giveaway. Scream is one of my favorite slasher movies ever. All but the 3rd. And I actually just saw the tv series. Not bad at all! I recommend it. Loving your list!